Play beautiful with a newer, better, and faster FIFA experience on mobile! FIFA 16 Ultimate Team lets you celebrate every awesome attack, nail-biting goal, and powerful win like never before with console-like graphics. Experience the most realistic set of football features on Google Play. Earn, trade, and transfer superstars like Lionel Messi, Jordan Henderson, and Juan Cuadrado to create your own fantasy team. Choose your play style, formation, kits, and more, then balance player chemistry for the strongest squad compositions. Choose from over 10,000 players from over 500 licensed teams and go to battle against other players from real leagues in real arenas from around the world. 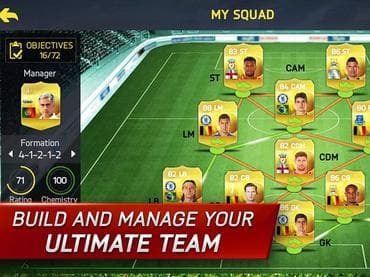 Если у Вас есть вопросы, связанные с игрой FIFA 2016 Ultimate Team пожалуйста используйте эту форму для связи с нами.